engineered to know when communications are needed, and to be able to communicate with other cars, with bikes, with people on foot. Where to go? When to walk? Uber Technologies has filed a patent toward that end, with a discussion on how self-driving cars might communicate with pedestrians. The patent title is "Light output system for a self-driving vehicle." The patent applicant is Uber Technologies. The patent looks at how flashing lights and signs on the outside of self-driving cars might tell pedestrians what is happening. David Nield reported on it in TechRadar. He noticed how "One image shows a 'please proceed to cross' sign on the front grill." An Uber designer explained the goal. Sean Chin, a product designer at Uber's Advanced Technologies Group, said in The Verge that the end goal was to communicate the intentions of the car so as to enable pedestrians to make their own decisions. If the communications say the car is slowing down, all actors, including pedestrians and cyclists who are pulling up along the side, can interpret the vehicle's state. "As operators, we have a high certainty about what the car is doing and what it plans to do," he adds. "What we need to do is enable pedestrians to interpret this behavior on their own." In the course of communication, a person can move the head, wave a hand, nod or flash some lights. Chin said, "what we're considering is what is a new language we can create to give people that information." "The ride-hailing giant proposes wrapping its self-driving cars in flashing signs to effectively communicate messages to pedestrians and others around it." 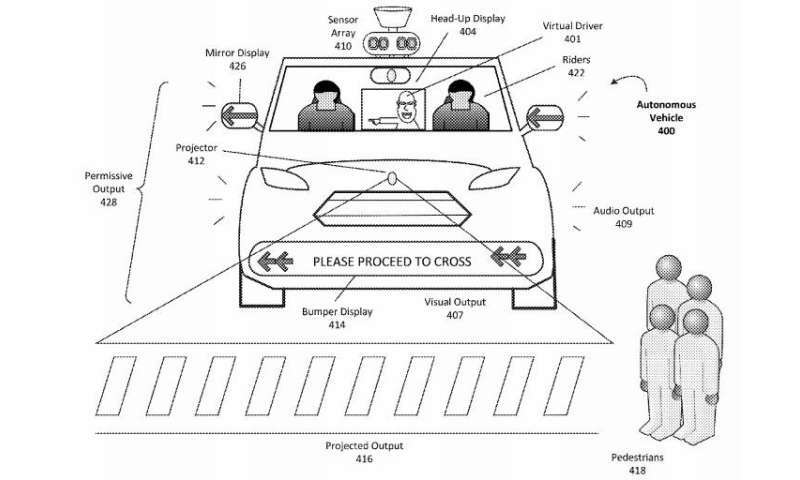 Specifically, "flashing arrows would appear on the side-view mirrors, a projector would display a virtual crosswalk in front of the car, and a "virtual driver" would pop up in the windshield to point pedestrians in the right direction," said Andrew Hawkins in The Verge. Sounds are being thought about too. "Uber's product team is also exploring how self-driving cars can communicate intent through 'vehicular sound' said Hawkins. What are the chances this patent application will materialize into something real for Uber in the future? The Verge said Chin cautioned that the application "should be seen more as a framework for how Uber was thinking about this issue rather than a final product." For sure, one takeaway is that Uber is serious about its work on self-driving technologies. In February, Taylor Soper in GeekWire noted "Uber's 80,000 square-foot self-driving engineering office in Pittsburgh, where the company first launched its Advanced Technologies Group three years ago." Regarding their research, Soper wrote that "Uber's tech-laced vehicle constantly scans its environment, detecting everything from pedestrians, traffic lights, and signage. It automatically drops its speed in school zones and knows when a bicyclist is approaching from behind. There are gadgets everywhere, from the spinning LIDAR units above to the powerful onboard computer in the trunk." Uber said on its site "While Uber is still in the early days of our self-driving efforts, every day of testing leads to improvements. Right now we're focused on getting the technology right and ensuring it's safe for everyone on the road—pedestrians, cyclists and other drivers."